I am moving to New York on September 21st. I have lived in Florida most of my life, besides one year when I moved to Atlanta, GA. I know it gets very cold in the winter there. Any tips on how to cope with the cold weather? Winters here in NY can be mild. To keep up just wear winter clothing (of course) and make sure to have adequate heating. If you are renting, make sure the landlord is in compliance with heating laws in NY, which calls for all apartments to be kept at a required minimum temperature (55 degrees or so). Any suggestions on good shoes to wear when it snows? lightweight silk underwear. Good leather gloves lined with cashmere or fur. Good boots and a stylish hat. No, not fur. We're trying to be politically correct here. Do many people wear rain boots? No. It rains more in Florida than it does in NY. You should have no problem. 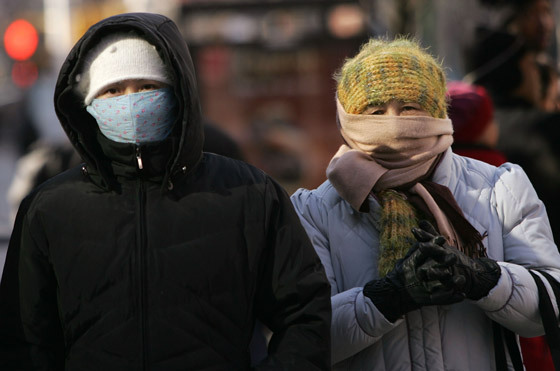 Yeah here in chicago it gets blistering cold, enough to make it hurt to breath. I love it, wonder if its the same in NYC. I moved to New York from Texas in the middle of winter (albeit a relatively mild one). The temperatures really didn't get to me - my interview trip fell during a week when the wind chill would cut right to the bone - you put on a warm coat and gloves and a scarf, and you'll be amazed at how warm you are as long as you're moving. The big adjustment was how long the cold weather dragged on for... when I was still in a peacoat (though at least not the 3/4 length one) in early May, I was completely baffled... I would've been sweating in tank tops in Texas at that point. That said, I didn't even realize that the weather was getting to me until we had a stretch of warm, sunny days... and I was suddenly aware that I felt like a new person. You'll be fine And when it's late August and you're actually a bit chilly in the mornings when you walk to work, you'll think about how you'd still be facing 2-3 months of HOT if you were in Florida, and smile. That does sound nice, its still about 83 degrees here every day! Why would you want to leave the warmth of Florida sunshine in the first place? I am majoring in Hospitality Management, so I am hoping to get some hotel experience in New York. Maybe once I graduate and I am experienced a little more in the hotel field, then I may go work at a resort somewhere. But who knows what will happen in the next couple years.